Hearty chicken smothered in curry sauce in a soft, flaky turnover-shaped pastry. Bacon and lettuce rolled into a spiral with dough studded with sesame seeds, all wrapped in a delicate sheet of seaweed, speared with a toothpick. Bits of shredded pork fibers are stuffed into this roll, making for a savory experience. 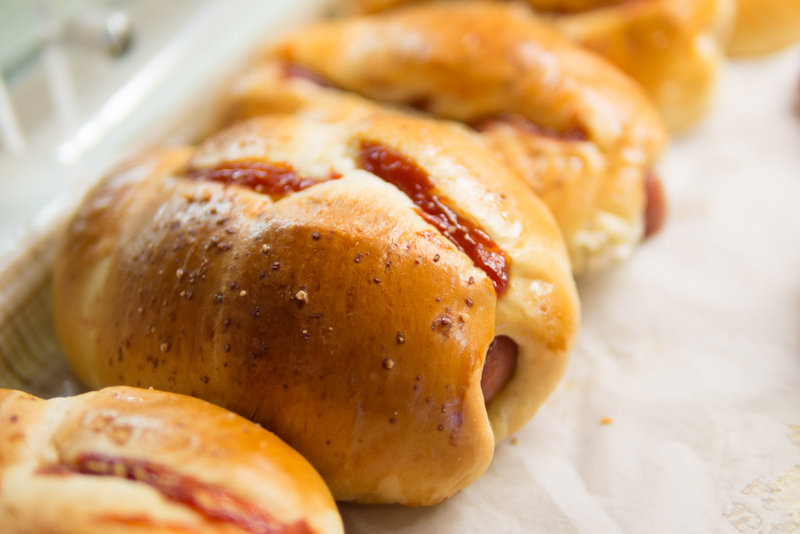 A twist on the original American dog, ours comes with dog and bun entertwined in an eye-catching design, flavored with Parmesan cheese. Shredded cheddar cheese and slices of sausage imbed our doughy, hand-rolled bread. This small, oblong bun is covered in the crunchy melt-in-your-mouth texture of the dried, shredded pork fibers. The light buttery flavor of the bun, coupled with the crisp, pork sung fibers makes for a savory treat. Distinctive for its lattice-like exterior, this polo is filled with fluffy shredded pork fibers, yielding a crisp, savory, and crunchy melt-in-your-mouth texture. 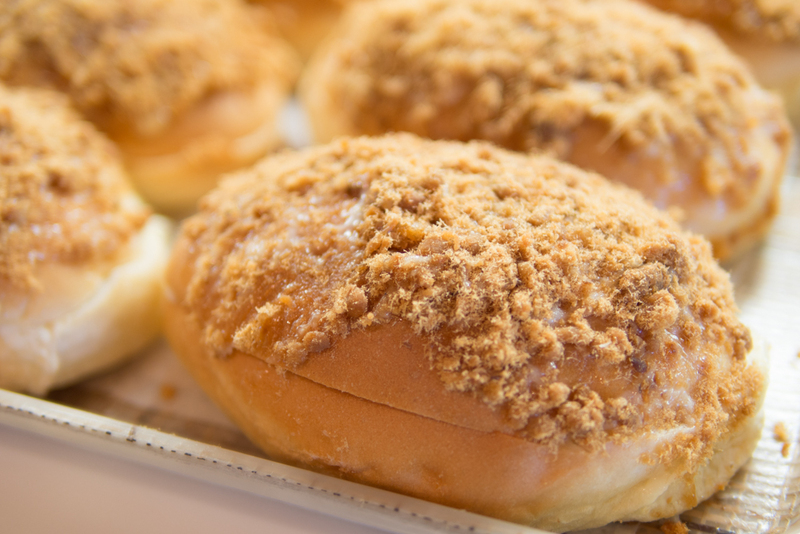 A crispy twisted bun decked with chopped peanuts, our peanut bun has an immediately distinguishable scent and is the perfect late night snack. An architectural miracle. The blueberry cheese is made of purple blueberry filling protected by a crusty, chewy dome. 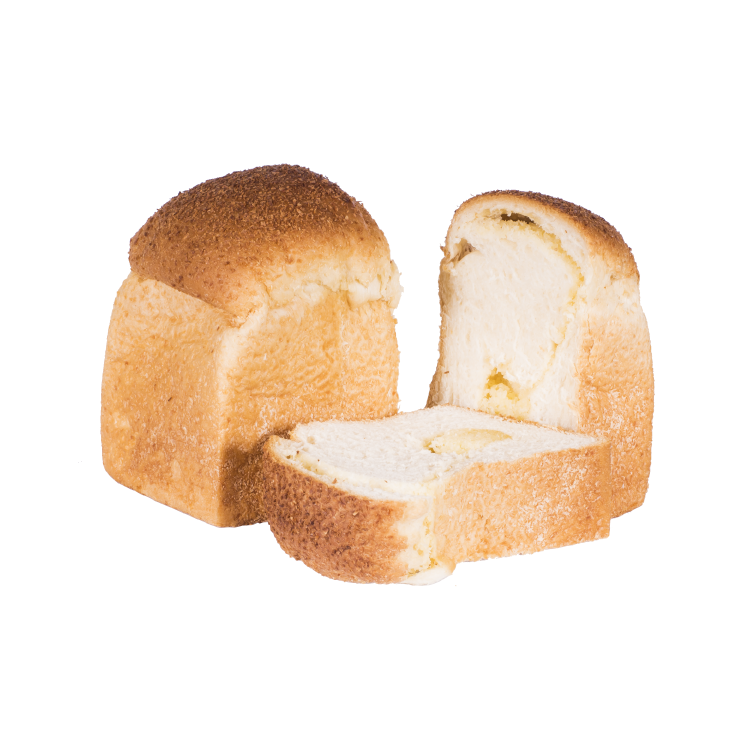 With its lightly toasted exterior and chewy interior, this sweet treat will have you coming back for more. A rather simple bread, really. Kernels of sweet corn and sliced ham decorate this doughy, hand-prepared bread, which is sprinkled liberally with chopped parsley. A round bread that hides chicken cooked in a spiceful curry sauce, sprinkled with wheat germ. Japanese inspired cupcakes so soft and pillowy you'll want to cuddle with it. Lightly sweetened and garnished with sliced almonds and dusted with confectioner's sugar. Adapted from its Malay origins, this treat is a light and airy spongecake, making for a perfect complement to our coffee drinks. The color comes from the use of Pandan leaves, which add sweetness. This multilayered Chinese treat has a flaky crust covered in a light egg wash crust and topped with a sprinkling of black sesame seeds. Inside, a sweet red bean paste surrounds a cooked salty egg yolk core, yielding a delightful mixture of complementary flavors. This treat features a flaky crust containing a mild lotus paste which surrounds a cooked salty egg yolk core. Light and airy fried dough and covered in sugar. Our fried donut is light and airy and is glazed with creamy chocolate. 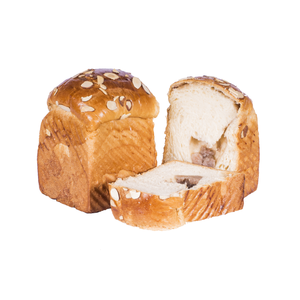 Freshly made daily, our breads are chock full of all natural ingredients. Made fresh daily, our toast is sprinkled with shredded coconut. A classic featuring juicy raisins embedded within our hearty toast. Glazed with a coat of apricot jelly and finished with a cherry, these circular tarts are stuffed with a moist, rich coconut filling that is a mix of chewy and crisp. Derived from an iconic Portuguese treat, our version consists of soft, creamy custard caramelized in a crisp pastry shell. 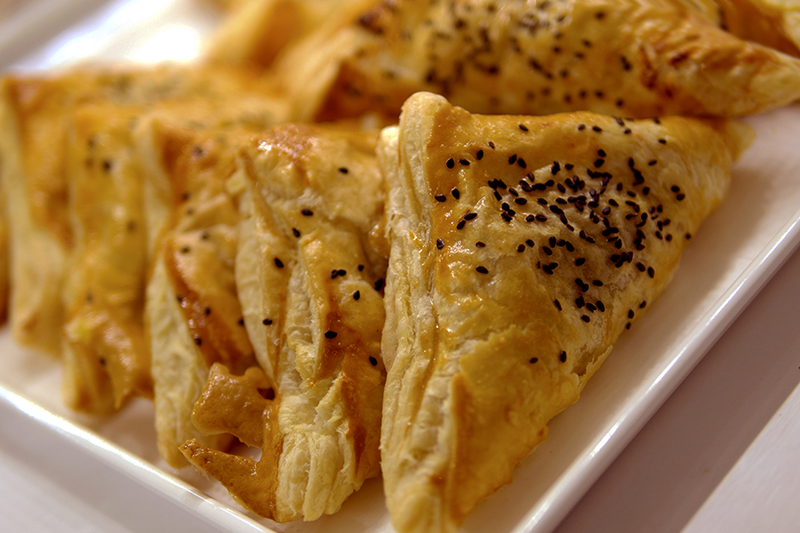 This puff features popular Hong Kong style BBQ pork hidden inside a soft, delicate pastry. 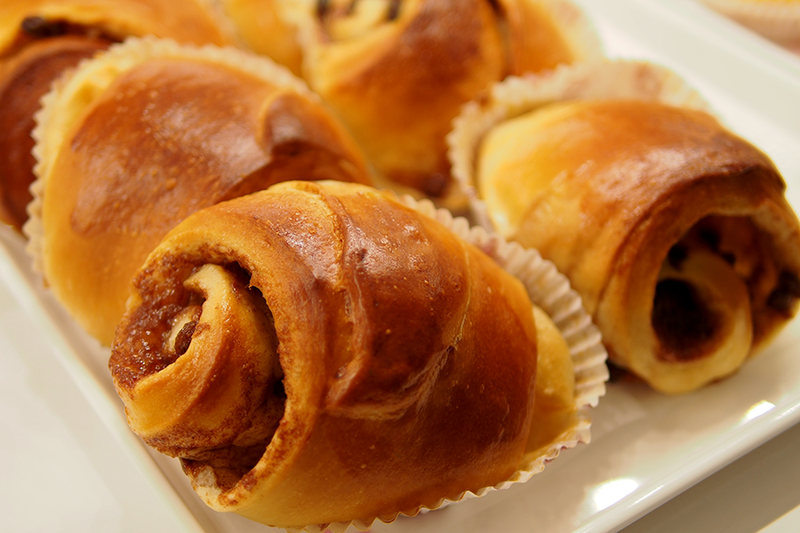 Our version of the cinnamon roll is lightly sweetened with honey and filled with cinnamon and raisins. This pastry features tender black pepper chicken sheathed in a light, flaky puff with a dusting of almond flakes on top. Pork tossed in tangy Asian BBQ sauce fills a round bun, a traditional Asian treat. 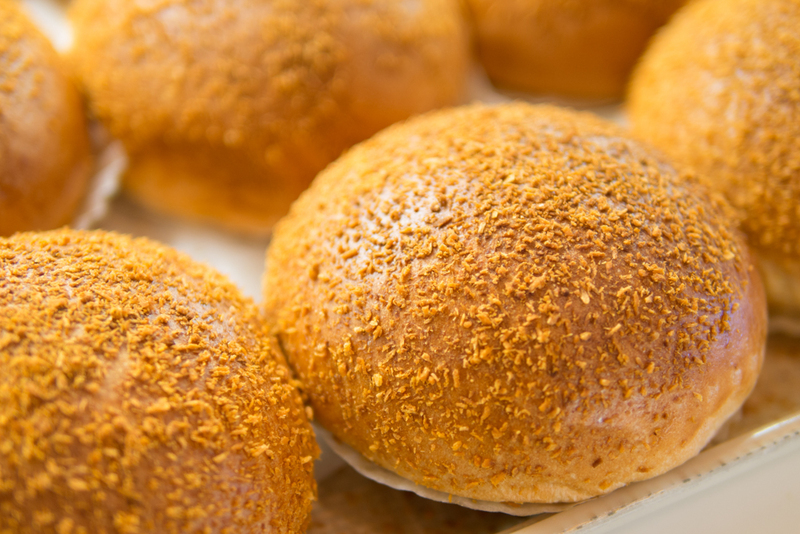 A traditional favorite from Hong Kong containing a sweet, buttery coconut filling, this bun is lightly coated in a final egg wash. Slices of almond cover this uniquely shaped bun, hiding a sweet, buttery coconut paste within. Dotted with almond flakes, this bun is filled with a mixture of sweet coconut and cranberry cream. Called the caterpillar for its long shape with soft ridges, this bun is filled with whipped cream, dusted with confectioner's sugar. 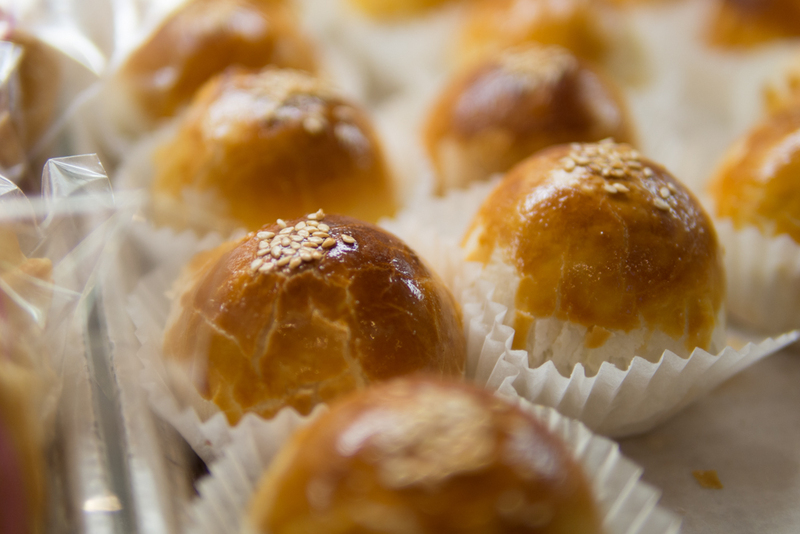 A cousin to our Red Bean pastry, this sesame-topped bun contains a sweet red bean paste wrapped in a glutinous mochi. A favorite of young and old alike, this soft egg bun hides a cool, creamy custard with a smooth taste, with creamy, milky undertones. Strawberry cream-cheese filling sandwiched in between a flaky croissant. 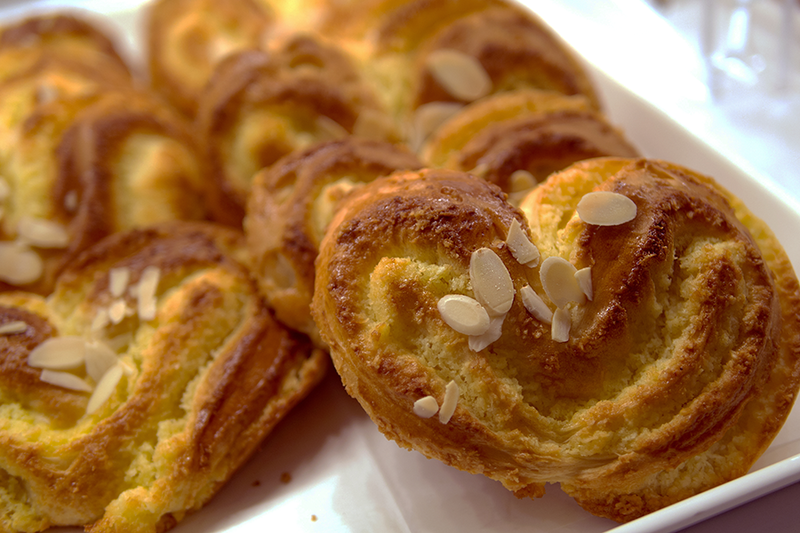 The Danish pastry comes embedded with almonds, with confectioner's sugar sifted over it. Hidden within its flaky exterior is a morsel of lotus paste with a mild, rooty flavor. Dense, candied pineapple paste baked into a crumbly pastry crust. This traditional Cantonese pastry has a thin flaky skin and a soft interior made of candied winter melon, almond paste, sesame seeds, and five spice powder. This bite-sized snack hides a sweet red bean paste wrapped in a flaky ball of a crust topped with black sesame seeds. Bet you can't eat just one! This little snack has multiple layers of flaky crust with a mild, rooty taro flavored paste inside. A loaf of bread with sweet purple taro paste running through. Red bean bits are embedded in our fresh baked toast. Like its namesake, these thin, crisp treats are sure to fly from their container to your mouth! These captivating French pastries are also known as "palm trees" or "elephant ears." Crispy, crunchy thin cookies are sprinkled with sesame seeds. Break them apart and stick them in ice cream for a pretty topping. Puff pastry with a million layers, topped with a sweet glaze and sprinkled generously with sliced almonds. Crunchy and sweet, these waffle shaped almond cookies are crisp with a delicate taste. Sweet bun baked with a milk cream filling and enveloped in a coffee flavored bun. Filled with bacon bits and white cheese, this bun is a bacon lover's dream. A traditional favorite, featuring a center filling of sweet red bean paste. A plump sweet bun, sliced open and filled with sweet cream, sprinkled with coconut flakes and topped with dried cranberries. 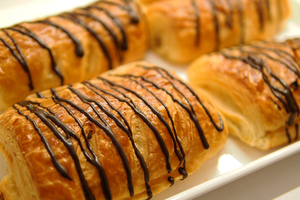 Folded inside layers of puff pastry, creamy Nutella chocolate is hidden inside this danish. Sliced ham and white cheese seasoned with pepper, this savory treat is perfect for breakfast. 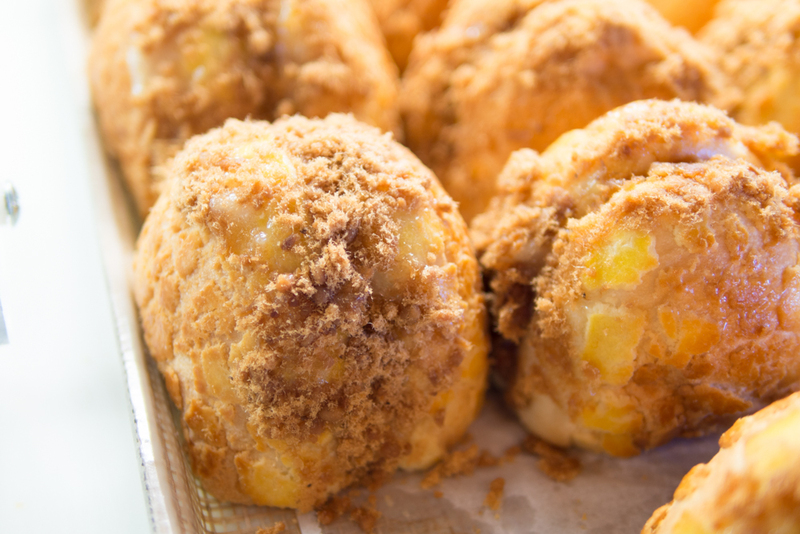 A bun filled with salted butter topped with a crunchy pineapple crust. The most adorable dessert bun you'll ever find, our mango pudding bun comes shaped like a paw print, hiding a pocket of creamy mango filling! A sweet bun filled with a Nutella center, topped with charming chocolate shavings. This vegetarian treat includes diced green onions ensconced in a soft bun. Our homage to the All-American staple includes chunks of hotdog and diced green onions baked within a soft bun. 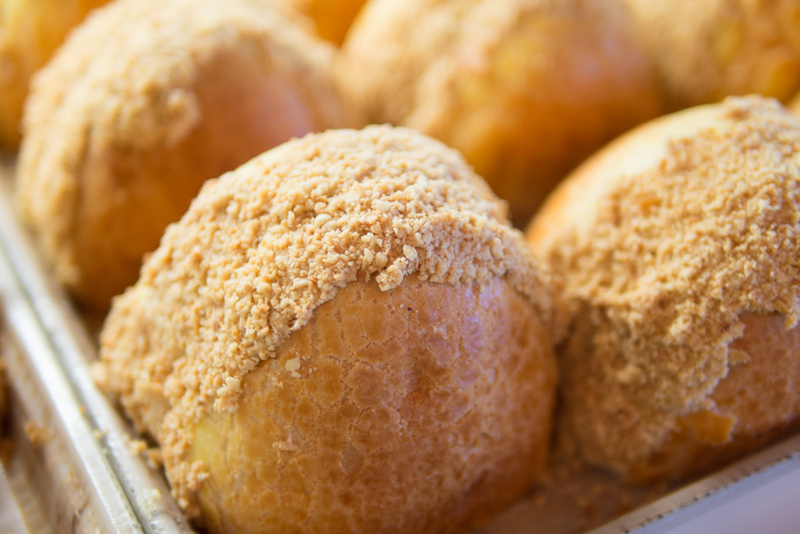 A bun with a balanced texture, the Taiwanese polo features soft bread inside encased in an exterior studded with crunchy, diamond-shaped dough. Though it looks like a muffin, this treat is imbued with the mild taste of taro. Hidden inside its hollow interior is a floor of taro-flavored mochi, a soft, gooey rice paste which is sure to delight those looking for a more substantial snack. Bright pink with a cherry amaretto glaze. This sweet treat is sure to please with a dollop of butter cream on top. Sweet, milky caramel covered in toasted almonds drizzled with a classic glaze. Filled with cream cheese and covered with red velvet cake crumbs, this donut highlights the best part of a red velvet cake, the cream cheese frosting. Filled with a sweet and tangy Lemoncello buttercream, this donut definitely has a sweet surprise inside. Topped with a thin layer of Nutella and covered with crispy cereal pieces, this donut introduces a new way to eat your favorite chocolate spread. This Japanese inspired donut has a matcha green tea based glaze on top of a classic donut ring. A chocolate glazed donut taken to the next level. Our version is glazed with Chocolate Ganache for a rich, velvety taste. Soft and Crunchy, this donut is the perfect balance between soft fried dough and crunchy Oreos. Filled with a Baileys Irish Cream Infused Donut, this adult version of the classic cream filled donut is the perfect sweet treat. Peanut butter and chocolate come together to form this sweet and crunchy donut. A perfect blend of sweet maple syrup and and savory bacon. This flavor combination is sure to satisfy all your taste buds. This soft and pillowly Japanese cupcake is filled with a dallop of Chocolate buttercream. This soft and pillowly Japanese cupcake is filled with a dollop of vanilla buttercream.